The water in the bucket is much warmer than the LN2. When the LN2 is dumped into the bucket, it warms up. When you heat a liquid, it turns into a gas. When a lot of Nitrogen is warmed up really fast, it suddenly takes up a lot of space. The soap lets us see the Nitrogen gas because it makes bubbles. 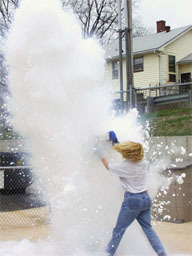 The more Nitrogen or soap we use, the more bubbles we get. This is the MOST DANGEROUS DEMO that the Physics Van does. Do NOT do this demo if you have not practiced it thoroughly. This demo is messy. If you're indoors, use a tarp to catch most of the soap. You will probably still have to mop some up. After the explosion, the floor will be very SLIPPERY. Be careful not to fall. If you're using food coloring to make the soap look less diluted, use only 2-3 drops. More than this will stain people's clothing. NEVER reach into the LN2 with the cryo gloves. They are NOT waterproof, so the LN2 soaks into the glove. This traps it close to your skin and freezes your hand. Be careful when you're holding the dewar to avoid touching the LN2 with the gloves. Don't drop the dewar. Dewars are expensive, and we don't want to have to replace ours because of dents. Hold the dewar by its edges, not by the handle. The handle can separate from the dewar, making you drop it. Even if you are not touching the LN2, the inside surface of the dewar is cold. Don't touch it with your bare hands. 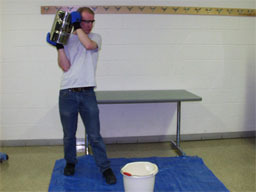 Always wear safety glasses in addition to the cryo gloves for LN2 demos. 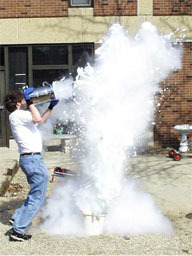 The LN2 can splash up out of the bucket. Although these small drops will evaporate right off your skin, they could cause serious damage to your eyes. Nitrogen travels farther than water when spilled because it doesn't adhere to warm surfaces. If it reaches the floor, it WILL reach the kids, and they will try to touch it. 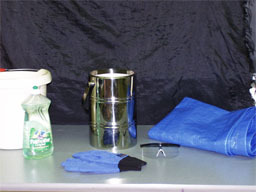 Make sure that someone is holding up the edges of the tarp to catch any stray Nitrogen (or soap). Liquid Nitrogen freezes stuff. Examples are: people's hands or feet, expensive gymnasium floors. The tarp will help to protect the floor, but it's just a safegaurd. The simple summary here is don't miss the bucket. Pay close attention to where the dewar is as you pour it. And if you do miss the bucket, don't hit your feet. Your shoes and socks will soak up LN2 just as well as the cryo gloves do. Do not do this demo until you are comfortable with the audience and experienced enough that the explanation is second nature. You should be able to focus your attention entirely on what you're doing, without the distractions of being nervous or unfamiliar with the explanation. 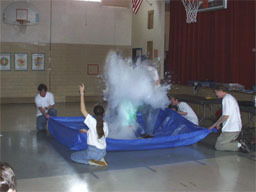 This demo goes all the way back to the beginning of the show when we were talking about solids, liquids and gases. There've been a lot of demos since we last used LN2, so you should review the states of matter and how the LN2 expands as it changes into a gas. In the dewar, the LN2 is a liquid, but when it hits the warm water, it changes into a gas. Since you're using a lot of LN2, it will take up a lot of space when it warms up. Adding some soap to the bucket will let us see how much space the gas takes up, since it will make bubbles. 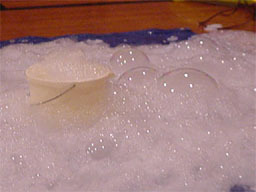 Just use a little bit of the soap, since more soap means more bubbles, and we don't want to make too much of a mess. While you're talking, other Van members can be adding more soap to the bucket. To be funny, they can use the entire container of soap. 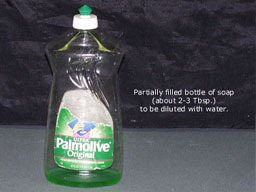 (If this is the case, the soap should be diluted. More soap really does mean more mess, and 2-3 Tbsp. of soap is messy enough.) Remember, MESSY = FUNNY. Hold the dewar overhand, with one hand under the back edge of the dewar and one curled over the front lip. Don't hold it by the handle, since the handle can separate from the rest of the container. 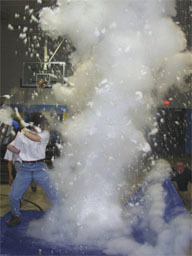 Get a countdown from the audience and dump all of the LN2 into the bucket. The more force that you dump it with, the bigger of an explosion you'll get. Once you've practiced with the demo and can get all of the Nitrogen into the bucket consistently, try to pull the bucket out of the way as soon as you've dumped the LN2. With the bucket out of the way, the soap bubbles can go up higher.